a. 1lb ground beef, chicken, or turkey - seasoned your favorite way and browned on the stove-top! I use a combination of enchilada sauce (homemade or store bought) and homemade taco seasoning to flavor mine, plus a little mexican hot sacue for a kick! You can also make your protein option in advance and keep in the fridge for 2-3 days or freezer for emergency taco night filling. This also works with my lentil-veggie taco filling too! Looking for extra crunch? 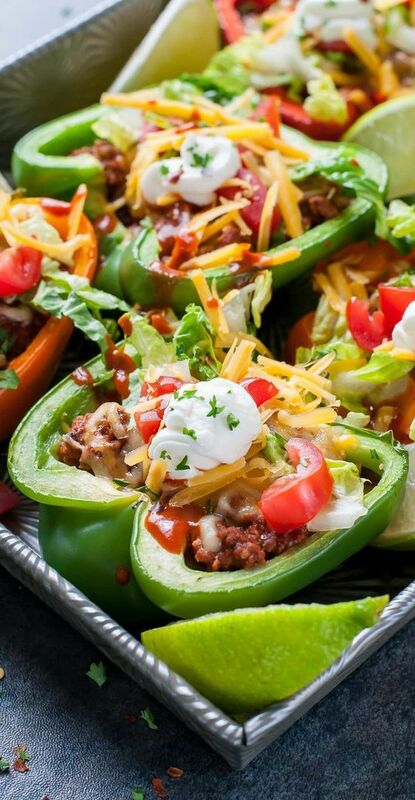 Try crumbling a few tortilla chips on top of your bell peppers or serve them with a side of chips and salsa! Pre-heat oven to 400 degrees F. Choose your protein option(s) from the above list and cook via preferred method. Lay peppers on a baking sheet and cook for 8-10 minutes until al-tente or for 10-15 minutes for softer peppers. Fill each pepper to the brim with your taco filling of choice (see above for tasty options; I made mine t-rex this time around) and top with cheese. 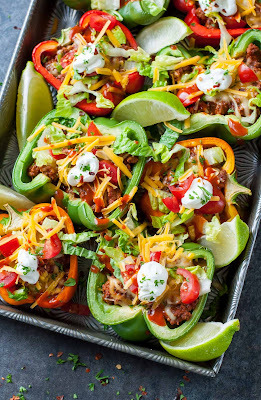 Bake for an additional 10 minutes, then pile mile-high with all your favorite taco toppings! Anything goes on taco night! Though I included the measurements I used for 8 bell pepper tacos, feel free to double, triple, or halve the recipe as desired. To fit your dietary needs, choose your own ideal combination of toppings and fillings from the lists above. The version I photographed was of the T-rex variety but snagging one of the vegan or vegetarian filling options I posted above will help you stick with your plan! You can also mix and match the fillings. Combine black beans and sautéed veggies with any of the protein options from ground turkey to tofu. Have fun with it! 0 Response to "BAKED BELL PEPPER TACOS"